After yesterday’s “basics” post, I was feeling a little more adventurous today; and since I had to use up four egg whites leftover from making the custard, I couldn’t think of anything more perfect then meringues. Preheat oven to 120 degrees Celcius. Set up baking paper on two baking trays (just one if making a large pavlova base). Get all your ingredients ready beforehand so you don’t have to put your hand mixer down while whiping. Put a pinch of salt into your egg whites and start whipping them up. When soft peaks form, start adding the sugar a little at a time, mixing well after each addition. Beat until the mixture is really glossy & stiff. Lastly add the vinegar, vanilla & corn flour, beat on low speed to incorporate. Spoon or pipe out ‘blobs’ of meringue onto the baking paper, and bake for an hour and 15 minutes. Turn off the oven and let them cool inside with the door ajar. While waiting for them to cool, whip your cream & make the fruit coulis! I used a blender for this, and just put the ingredients in and blended until smooth. If I was using raspberries or blackberries I would strain the seeds out but the strawberry seeds are so small. 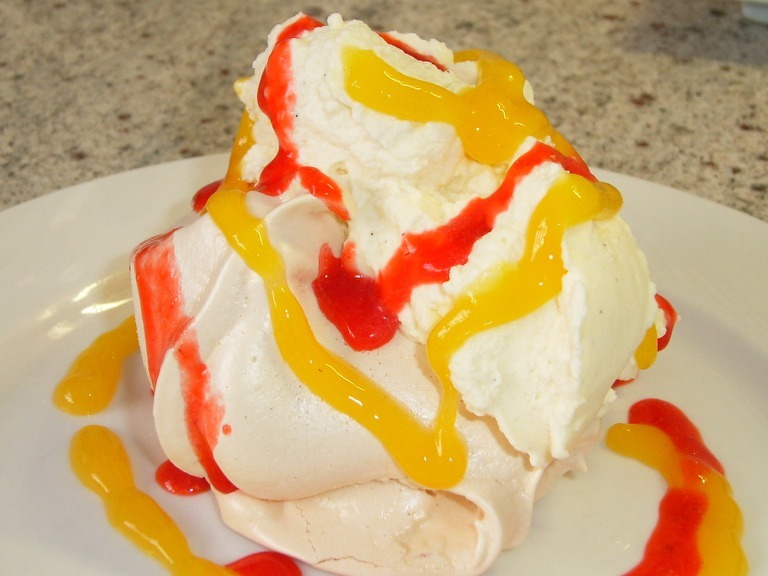 Top your meringues with whipped cream and plenty of fruit coulis. Enjoy while thinking of summer days in the garden! This entry was posted on September 28, 2008 at 3:55 pm and is filed under Sweets. You can follow any responses to this entry through the RSS 2.0 feed. You can leave a response, or trackback from your own site.